I’m alone in the house, studying for my exam in change management on Wednesday. It’s quiet, which is a rare thing. Frida is at a friend’s birthday, and Mads and Ronja went shopping for some of the stuff that we need for this year’s summer vacation. We are going to the Swedish Archipelago (Skärgård) on the East side of Sweden – provided the weather allows us. I cannot wait. Four weeks of sailing, relaxing, enjoying the beautiful surroundings, bathing (hopefully), and eating icecream whenever we feel like it. Things are busy around here. The kids are always going places, Mads and I are busy with work and the thousand other things that we want to do. My Instagram has become my mini-blog, because finding the time for blogging is not as easy as it used to be. I have been able to find some time for sewing, though. I made this summer dress for Frida. 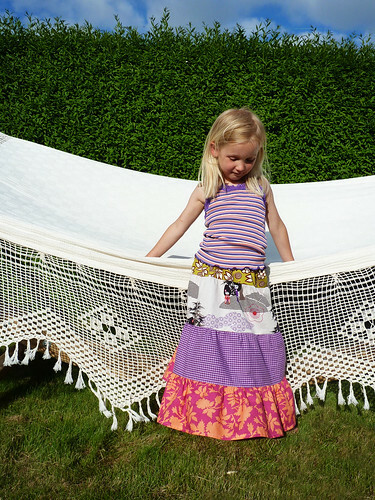 Frida chose the fabric herself – this is and Erin McMorris design that I found long ago at Fabric.com. 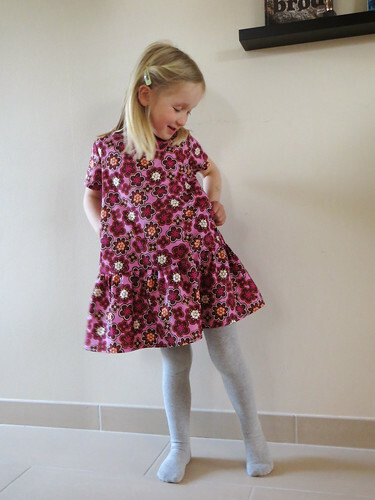 The pattern is from Ottobre 3/2013 – it is quite simple and has side seam pockets, which I rather like. As usual, the patterns are a bit wide for Frida, so I drafted a 104 width and a 110 length. The dress was an instant hit. So a few weeks ago, I was wearing a long skirt, and Frida complained that she didn’t have one. I made her this tiered skirt. For once, I didn’t have a pattern, and I am really not used to not using one. However, I wrote down the measurements I thought were right, and it worked out brilliantly. She loves it. 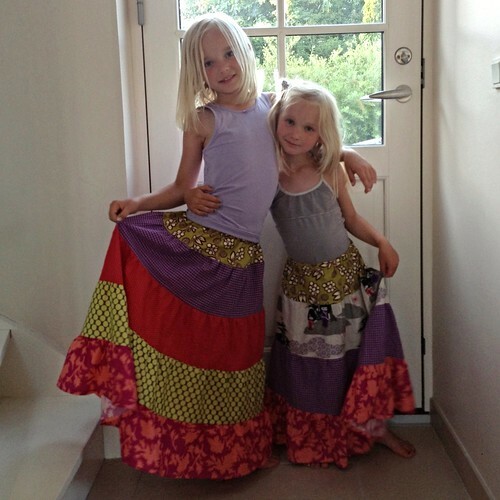 When Ronja saw it, even she wanted one, so there we go – two gypsy skirts (which I think, is what they look like). I love them! Almost want to make one for myself, but that would take quite a bit more fabric, I’m afraid… I may share the measurements on the blog, when I get around to it, if anyone is interested. Also these skirts can easily be modified into dresses, merely by adding shoulder straps. I would like to make a few, but we’ll see how much time I have. 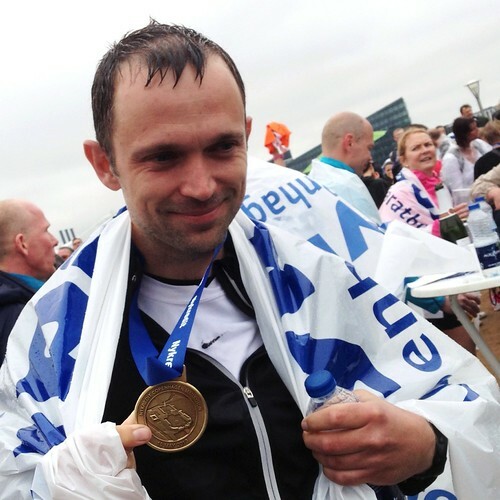 On a different note, recently Mads achieved his goal of running Copenhagen Marathon! His time was 3:53:07, and I think he’s the coolest guy in the world! 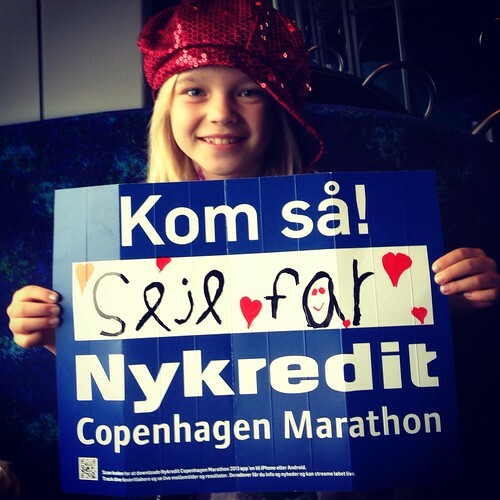 Ronja and I went there to cheer him along, and I believe it was almost as much of an experience for us as it was for Mads (ok – almost, right!). This video shows him passing the finish line – you need to click “MÅL” to the right. He passes to the left – do you see him? It just about rained the whole time – Ronja and I gave up on the umbrella we bought, because it was just raining to hard for it to help at all. So everyone was happy to get back to our warm, dry house when it was over. Mads does all kinds of fun stuff at the moment. 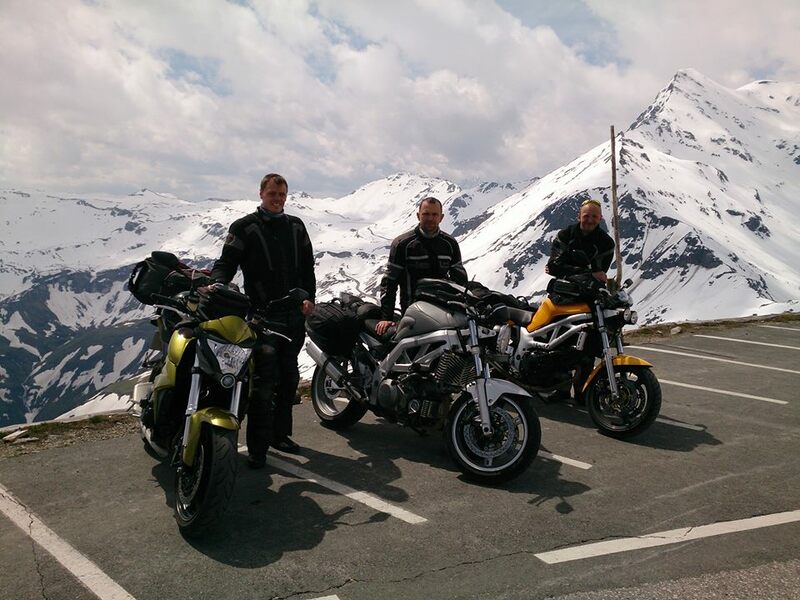 A few weeks ago, he went motorcycling with a couple of friends of his in northern Italy. For a week! I’m not going to say much about it, because I wasn’t there, but they had an amazing time (I heard). Meanwhile, I was alone with the girls, which was kind of nice too. During the weekend we made a fire in the garden, made twistbread, read stories, and they slept in our tent in the garden, which was an experience for both of them. This entry was posted in Blogging, Frida, Instagram, Ronja, Sewing and tagged dress, italy, life, marathon, motorcycle, Sewing, skirt, tiered skirt. How lucky is Mads! And obviously determined! The dress and skirts are gorgeous! I have made Maeve a couple of shorter tiered skirts, and they were real hits. Have fun on your holiday…I must get going on instagram….I need to see your holiday pics! 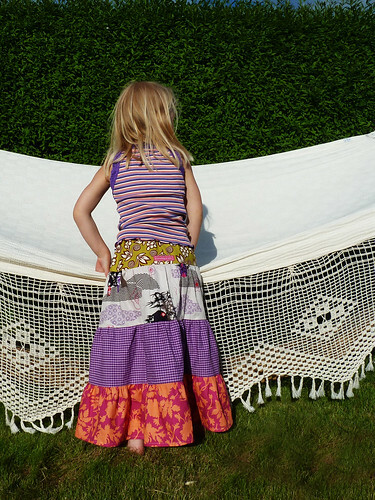 Love the sewing, I think my girls would adore those long skirts and it’s a great option for scrappy pieces of fabric too. Good luck for your exam! to make a new cover for the bed.